13 August 2015. Article by Li Yang and Karl Fjellstrom, updated in December 2016. 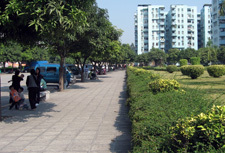 In Guangzhou’s rapid urbanization process, many farmlands were transformed to urban land and used for new developments. The core village settlements typically consist of a handful of houses and an ancestral hall and small public square. The core village remains in place while surrounding land is transformed from agricultural fields to extremely high density “urban villages”. Urban villages are very dense, with ground floor shops in the major alleyways, and practically car free because the winding interior alleyways are too narrow for motor vehicles. The houses are generally owned by the original villagers who have become wealthy absentee landlords while the majority of the population are migrant workers who rent cramped living quarters. 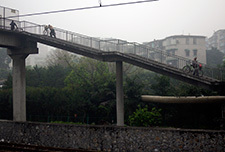 See this link for photos of urban villages in Guangzhou. 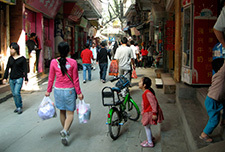 Urban villages are very dense, with ground floor shops in the major alleyways, and practically car free. Guangzhou has 304 urban villages in the metropolitan area, 23 of which are located along the 23km BRT corridor. There are about 6 million people living in these villages, and an estimated 5 million of them are ‘floating’ or unregistered population. 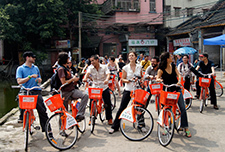 In May 2014 the Guangzhou government approved a 3-year action plan to solve the safety issues of urban villages. According to the action plan, improvements to about 30 demonstration villages should be carried out by the end of 2014 and 118 villages should be renovated by the end of 2015. Contrary to the earlier redevelopment plans, this action plan focuses on upgrading the infrastructure and management system of the urban villages instead of tearing the villages down and replacing them with highrise apartments. 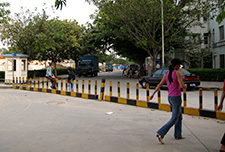 In October 2014 the Party Secretary of Guangzhou proposed a campaign for creating a “clean, tidy, safe and orderly” urban environment. Measures were to be carried out by the Sub-district Offices or Jiedaoban (街道办事处, jiedao banshichu). Jiedaoban forms a level of government lower than the district level, and one Jiedaoban usually manages 10 to 20 urban communities (juweihui, 居民委员会) and urban villages (cunweihui, 村民委员会), which is the lowest level of governance. Tianhe District government chose Chebei Jiedao, an area with large urban villages also located along the BRT corridor, as the demonstration area for the urban environment upgrade campaign. 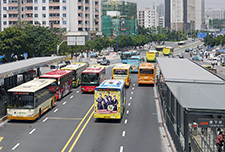 In November 2014 the campaign was expanded to Tangxia Village and Shipai Village – two of the largest urban villages along the BRT corridor. Tangxia Jiedaoban covers 7.42 km2 of land which includes the 0.3 km2 Tangxia Village. 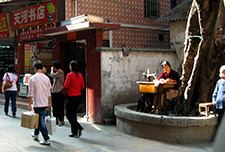 The total population of Tangxia Jiedaoban is 350,000 of which an estimated 260,000 are migrant workers. 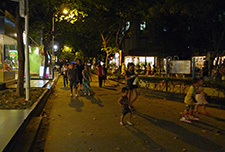 It is one of the largest urban village areas in Guangzhou. 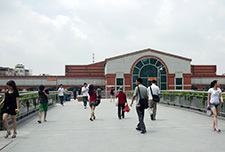 Tangxiacun BRT station is one of the most heavily used BRT stations in the world, with around 8,000 boarding passengers per hour in the peak hour. 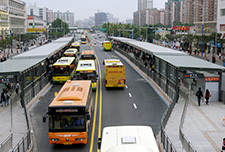 A survey in September 2014 showed that 70% of the people exiting Tangxia Village in the morning peak use BRT buses. 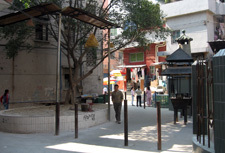 ITDP carried out work in 2010 proposing urban design improvements in the Tangxia BRT station area, but these were only partially implemented and Tangxia urban village was included in a list of urban villages slated for demolition, which contributed to a gradual degrading of the urban environment. With the new policy of urban village upgrading in place, the situation has now been dramatically reversed. 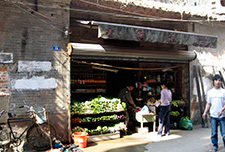 Many shops in Tangxia Village have also responded to the improvements by installing glass frontages, making the urban village interior more appealing to pedestrians. In the urban environment upgrading, Tangxia Jiedaoban has dramatically improved its infrastructure and management. 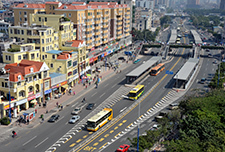 From November 2014 to mid-2015, Tangxia Jiedaoban has widened and paved over 3500m of streets, built 3000m of walkways, installed 4200m of traffic fences and 158 bike parking racks, and has dredged and rebuilt the sewer for 150 streets, which has solved flooding problems in 26 locations. It has also cleared up the informal stalls, garbage and unsafe cables. The main access walkway in Tangxia Village was repaved again in December 2016 with higher quality granite paving stones. Tangxia Jiedaoban implemented a street cleaning system in which staff help maintain clean streets for 16 hours each day, and requires the shops in the street frontage to keep their doorways clean and formalize their business operations. Many shops in Tangxia Village have also responded to the improvements by installing glass frontages, making the urban village interior more appealing to pedestrians. Tangxia requires cars to park only in designated spots. Tangxia initiated a new management system of the businesses, cleanliness and security that is divided into grids, with each grid managed by the village leader. The residents and designated staff also play important roles. The management team has a patrolling and cleaning schedule, and their contact details are open to the public so that people can contact them as soon as they find any problems in the area. The Jiedaoban has also installed over 500 HD-CCTV cameras and set up Wechat groups to monitor the security and environment of the villages. As a result of these dramatic urban village improvements the BRT station areas and BRT station access routes connecting to the urban villages are now greatly improved. 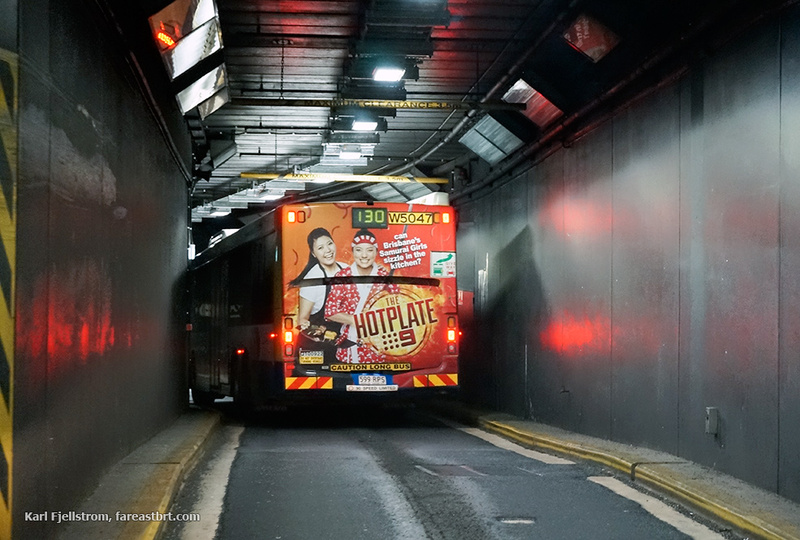 See also: Urban villagers rely on BRT for access to jobs & opportunities. The Tangxia gateway in July 2015. 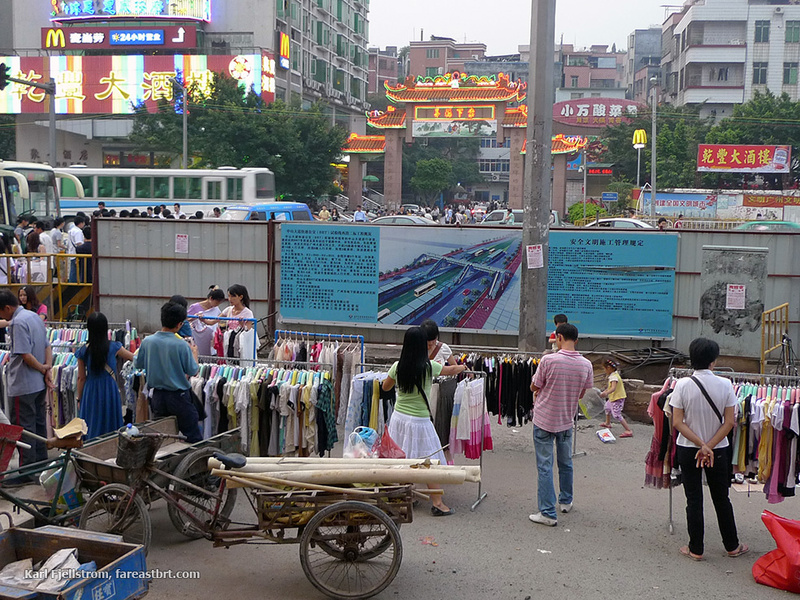 The Tangxia gateway in 2009 (top three) and May 2010 (above) was a degraded space used for parking cars and vans. Drainage and paving on access lanes to the BRT within Tangxia Village have been upgraded, and many shops have installed glass frontages, greatly improving the walking environment. Information boards about the Tangxia Village regeneration project. Location of Tangxia Village within Tangxia Sub-district. 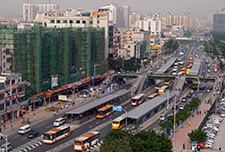 Tangxia gate in June 2009, with the BRT station under construction and BRT station rendering on display in the foreground. Chaotic conditions can be seen in the background around the village gateway.